Steve Rudzinski | It's Bloggin Evil! One Hell of an Evil Ride! Scream Park review! I’ve never been big on a budget film, or any other film, riding the coattails of famous actors by name alone. The style of marketing seems like a scam, a racket, a trick, or a scheme since most of the time the actors or the actresses are in the film for a whole five minutes, if that. Scream Park pulls the same kind of marketing headlining the film with Hellraiser’s Pinhead himself Doug Bradley at the top of the DVD cover. Like any and all movies in que for a review, a chance is given and so I continue with my viewing of Cary Hill’s Scream Park with Doug Bradley. Bradley’s presence is a quick snapshot, but the entire film is worth a long take when a good slasher is considered. THe horror inspired amusement Fright Land is shutting it’s rundown doors for good and the handful of workers are looking to have one last after hours hurrah with booze and a little sexual mischief. 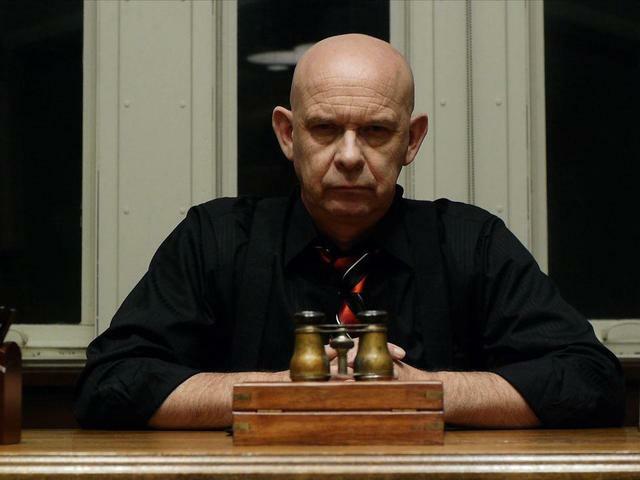 Park owner (played by Doug Bradley) has another idea to spark more life into Fright Land that will have ride goers remember Fright Land forever. Hired killers lurk through the darkness of the park and one by one the teen workers are hunted down. Scream Park starts right from the get go with the last few minutes of park operations and right into where our killers enter the park. There is no time to digest the cast of characters, but writer-director Cary Hill pens just enough information about each character to establish credibility of being. In fact, the killers don much personality as well. Former Skinny Puppy band member Nivek Ogre is a psychotic and deranged hillbilly with no real background other than those traits, but is there a real reason for murder? Ogre’s brute force, unspoken “Ogre” has the strength and measurability of a Michael Myers like killer. The practical effects are a nice touch in a computer generated effects world and the amounts of blood spilled warrants recognition. The death scenes are nothing out of the ordinary – a cut throat, a snapped neck, a strangulation – but there are a few that stand out and are nicely done with all the dramatic bells and whistles – see the axe to the head scene! Basically, the killers resemble English invaders of Scotland and commit all but pilferage the rickety old park. The acting could use some work as the delivers come off as robot-like and scenes seem obviously rehearsed. Unnatural is the term that comes to mind. Kailey Marie Harris gives a jaw dropping performance when she takes off her top and exposes her mammoth melons – goodness gracious. Speaking of maturity, the cast will mature as I see potential in leading lady Wendy Wygant as the fear in her eyes is convincing. You can tell experience from inexperience in the five minute scene with Doug Bradley and leading man Steve Rudzinkski as the park Manager. Bradley has not lost his touch since Hellraiser and continues to be powerful and compelling even for only a short time. 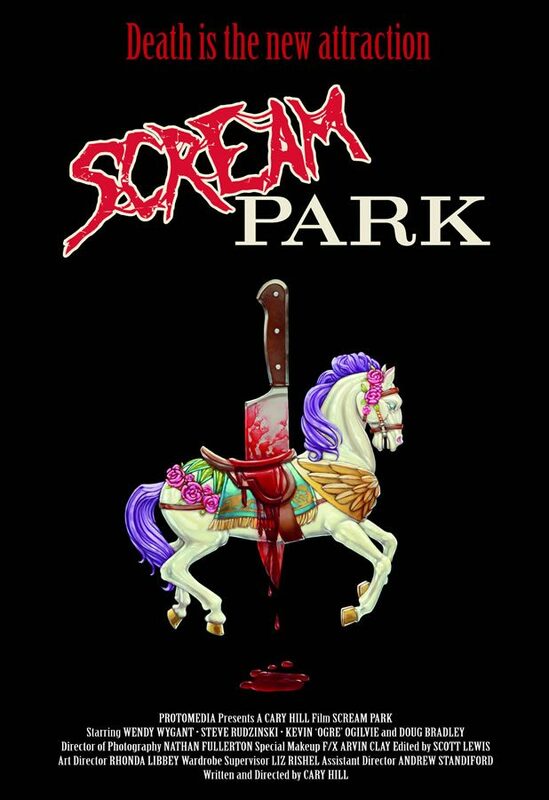 Scream Park is a good edition to any slasher collection. More low budget horrors should look to Cary Hill’s film as inspiration and as an example. Though the film was made back in 2012, I’m finally treated to a DVD copy by MVD and Wild Eye Releasing that is set to hit the streets April 22, 2014.